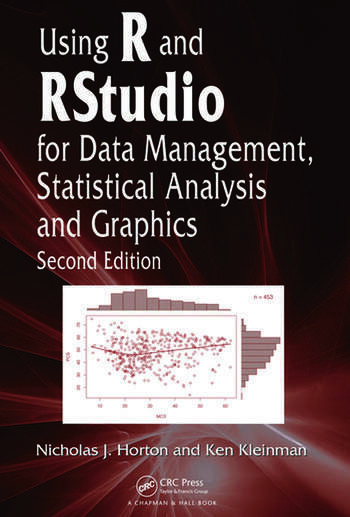 Incorporating the latest R packages as well as new case studies and applications, Using R and RStudio for Data Management, Statistical Analysis, and Graphics, Second Edition covers the aspects of R most often used by statistical analysts. New users of R will find the book’s simple approach easy to understand while more sophisticated users will appreciate the invaluable source of task-oriented information. Conveniently organized by short, clear descriptive entries, this edition continues to show users how to easily perform an analytical task in R. Users can quickly find and implement the material they need through the extensive indexing, cross-referencing, and worked examples in the text. Datasets and code are available for download on a supplementary website. Nicholas J. Horton is a professor of statistics at Amherst College. His research interests include longitudinal regression models and missing data methods, with applications in psychiatric epidemiology and substance abuse research. Ken Kleinman is an associate professor in the Department of Population Medicine at Harvard Medical School. His research deals with clustered data analysis, surveillance, and epidemiological applications in projects ranging from vaccine and bioterrorism surveillance to observational epidemiology to individual-, practice-, and community-randomized interventions. "The second edition of the book preserves the many good points of the first, and makes some improvements to the structure, e.g., on the graphical compendium. It also contains added material on more recent possibilities…is a good buy, if the goal is to have a reference book which allows to quickly find a way of accomplishing a task at hand in R, be it with or without RStudio." "… the book is easy to use. I have had it on my desk for the past few weeks and it has become invaluable. For those, like me, who find themselves regularly switching between R, MATLAB, and Python—or similar packages—it can save a lot of time." This book is an excellent reference resource. Used this way, it can be helpful for years to come for both experienced and novice users. The organization of the material makes it easy to find the relevant piece of information either by topic (from the table of contents) or using one of the indexes. The task entries are self-contained. Users with experience in technical computing may use it as a quick starter in R, as well. This book provides a concise reference and annotated examples for R … . It is needed because R does not come with a coordinated manual … It is much easier to find information in Horton and Kleinman’s book because of their more detailed indices and table of contents. … Horton and Kleinman have succeeded very well in their goal of providing a concise reference manual and annotated examples. If you know the statistics (or can look them up) and have some experience using R, it is an extremely useful reference, and it has become my most consulted R book. … it would be an excellent reference for those wanting look up the syntax of a command together with an example of how to use it. 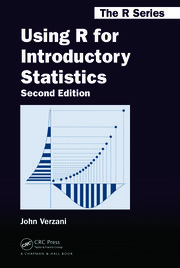 It is also very useful if you cannot remember the command and want to know how to do it in R.
The interesting aspect of the book is that it does not only describe the basic statistics and graphics function of the basic R system but it describes the use of 40 additional available from the CRAN website. The website contains also the R code to install all the packages that contain the described features. In summary, the book is a useful complement to introductory statistics books and lectures … Those who know R might get additional hints on new features of statistical analyses.